Jan has always found beauty and comfort in art. Whether she is molding edible flowers, decorating cakes or strumming guitar strings, she's found her passion in what her hands can create. Jan started out believing her path was a conventional one - she focused on her English studies at the University of Arizona to invest in a stable, liberal arts career but nothing aligned so well as it did when she decided to embark on a culinary arts journey instead with The Art Institute of Tucson, Arizona. Since then, Jan has became a pastry chef in Seattle, Washington. Her cake artwork is built on simple elegance - with the most complex cakes designed with illuminating seasonal bouquets of flowers. They are created to sweeten and elevate any celebratory occasion, not just weddings. 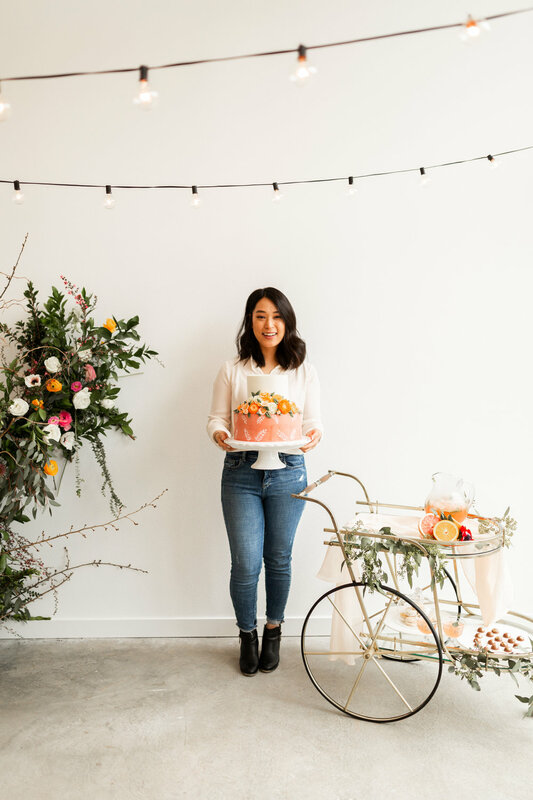 Her pastry and desserts are borne from classical French technique, refined by the Korean eye for delicate perfection and inspired by the culturally-diverse creativity Seattle surrounds her with. Jan currently lives with her husband, Brandon, in downtown Seattle. She is a lover of Christ, of books, of art, and of life - always striving to live it humbly, purposefully, and passionately each and every day!